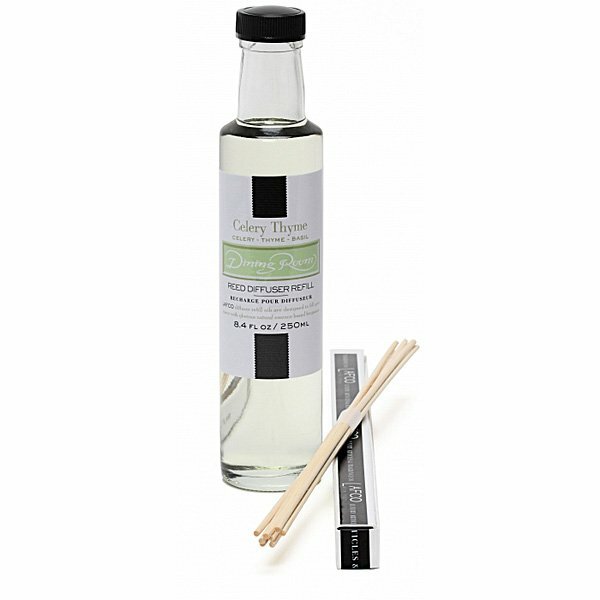 LAFCO Dining Room (Celery Thyme) Diffuser Refill is a subtle combination of crisp celery, Russian thyme, and a pinch of celery seed that gently scents the air, inviting friends and family to stay at the table long after the last bite is gone. A memorable meal should include good food, great friends, and inspiring conversation. The LAFCO House and Home Diffuser Collection is specifically designed to create an elegant atmosphere and compliment the ambiance and decor of each room in your home. LAFCO Diffusers freshen and invigorate. LAFCO Diffuser Refills contain one 8.4 fl oz/250 ml fill bottle of fragrance essential oils (natural essences 90% minimum) and one bundle of 8 natural reeds.